Lakeshore Baptist Church, in partnership with the Mississippi Baptist Convention, hosted disaster relief training this past Saturday. 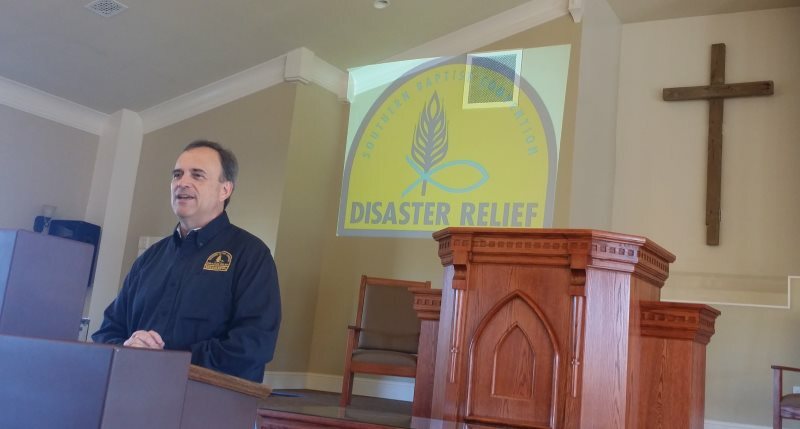 Don Gann began the day with an introductory seminar, “Involving Southern Baptists in Disaster Relief,” Participants then received training in the following areas: Feeding Unit, Chainsaw Work, Chaplaincy, Childcare, Mud out/Tarping/Shower Trailer, and Basic Assessment. Over 50 people were involved in the training. After lunch, cooked and served by the feeding unit team, the chainsaw crew practiced by downing a tree in front of the new church building. By the providence of God and the skillful work of the team, the tree fell precisely as intended. The work revealed, however, how rotten the inside of the tree was. If we had not cut it down, it would have soon come down on its own and hit either the church or the power lines. We praise the Lord for his hand of safety. We highlighted the day with the prayer that our training would be needed as little as possible. Visit the MBCB website for more information about how you, and your church, can get involved with Mississippi Baptist Disaster Relief. I can not thank everyone enough, especially Don Gann, for a very successful day to the glory of God.